Early developments (National Cancer Institute Brochure, 1972; Rosenberg et al. 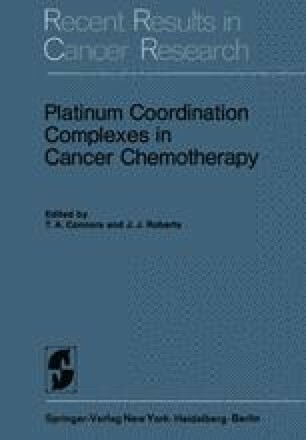 [13, 14, 15]; pharmacology [1, 2, 4, 5, 7, 11, 18]) and animal tumor effectiveness ([7, 8, 12, 19, 20, 22]) have led to clinical programs [3, 16], Talley and O’Brien involving platinum derivatives. In personal communications (Schabel), discussions have centered around possible therapeutic potentiation of 5-FU by cis-platinum(II) diamminedichloride (PDD) in mouse L-1210 leukemia. As 5-FU was first synthesized and utilized clinically at the University of Wisconsin, much of our time has been spent in developing treatment modalities with 5-FU alone or in combination with other cytotoxic drugs. Certainly, we felt that potentiation of the tumoricidal action of 5-FU would not only benefit known responsive malignancies such as colon or breast adenocarcinomas, but could possibly induce increased activity towards minimally or previously unresponsive malignancies.